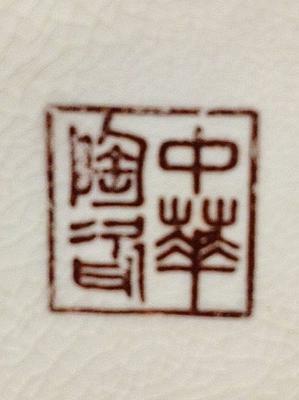 Greetings, need help identifying this mark on the bottom of a vase. Vase has a broken lip and is about 15" tall. Glaze has total crackling. Thank you, Shannon. The mark says Zhonghua Taoci (China Ceramics Co.), not sure about their English name. The company operated in Taiwan from 1958 to 1989 (approx. 30 years), producing mainly vases and decorative items with classical, hand-painted decorations. In Taiwan their products are considered as highly collectible.